The BBC news reported murky grim weather for Friday as I travelled down to Berneray to attend “Exploring over 200 years of emigration from Berneray”, a conference hosted by Berneray Historical Society. However, both weather and conference were glorious! The conference forms part of a project to document and trace information on the Berneray diaspora. The conference opened with a fascinating talk by Dr Marjory Harper of the University of Aberdeen who gave an overview of Scottish emigration patterns. This not only covered the main places emigrated to, such as North America, Australia and New Zealand, but also the reasons for going. In the 18th century, the change in dynamics between clan and clansman to a laird and tenant relationship lead many to head off as they feared they would not be able to afford rents in the future rather then any poverty they were necessarily in at the time. The notorious clearances of the 19th century, such as the clearance of parts of South Uist and Barra by John Gordon of Cluny, saw people being forced or assisted to leave. Peter Kerr, the Berneray project officer, followed outlining the work of the project. The difficulty in identifying who left the island over the last 200 years is difficult due to the quality of surviving records. However, Peter believes the historical society has identified over 250 emigrants. An appeal has been made to heritage groups, Gaelic and Caledonian societies and Scottish organisations across the world to try and trace Berneray descendents with some success. After a wonderful lunch provided by the Berneray hall committee, Marjory returned to present stories from a oral history archive she has created of interviews with Scottish emigrants, with a focus on Hebridean emigrants. The stories related to emigration predominantly in the 20th century, including people who left Stornoway on the “Metagama” and the Uists on the “Marloch”. Common themes were homesickness and the challenges of arriving in a new country. However, links to home were strong and commonly island emigrants were able to link up with other emigrants allowing parts of the Gaelic culture to continue. Some of the oral recordings presented were truly heartbreaking, with one lady’s tale of severe homesickness being clearly emotive. These stories, heard directly from their tellers, really demonstrated the value of oral history projects to record this otherwise intangible heritage. Peter finished off the day with an account of Berneray emigrants who headed to Australia. The project had made contact with a number of emigrant families in Australia which has really borne fruit. As a result, a Berneray research group is now active in Australia discovering more about what happened to Berneray folk once then had left. Several members of the group have even visited Berneray! 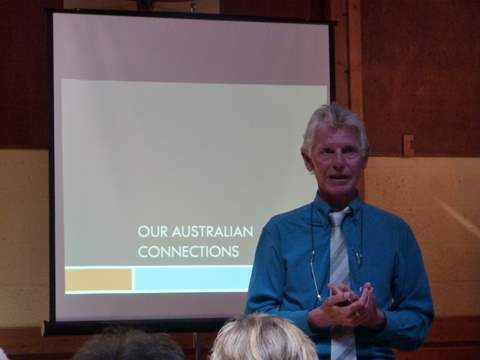 The story of three families of MacCuspics was told by Walter Sphor of Australia, who sent a presentation and his own vocal commentary to be played at the conference. What was clear was that these people valued their Berneray heritage yet the survival of the Gaelic culture emigrants took with them was not always retained. North America has retained more of that culture than the Australians but this possibly reflects the greater levels of emigration there. Peter is very keen to hear from anyone with Berneray connections, regardless of where they live, be this the Scottish mainland or overseas, in order to find out more about the cultural identity they may have retained. Similarly, Marjory is keen to make contact with, and potential interview, emigrant family’s around the world who left Scotland during the 20th century. Please contact Peter at through http://www.isleofberneray.com/berneray-historical-society.html if you can be of help to him or Marjory. 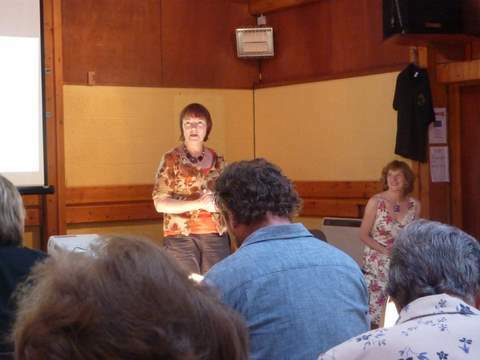 Congratulations to Berneray Historical Society on a wonderful conference. it made me wish I was from Berneray!